At present, dental implants are the most reliable treatment for loss of teeth. 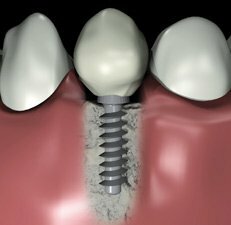 Depending on the clinical case in question, fixed implants are either cemented or screwed to the implant abutment (which connects the implant to the replacement tooth). Discovered by Professor Bränemark (inventor of titanium dental implant) in the 1960s. Dental implants are artificial roots made of titanium which are embedded in the bone. No allergy to titanium has been detected to date as titanium is a biocompatible material. On contact with titanium, the bone heals and fuses; this is called osseointegration. It takes two to six months for complete integration to happen, depending on the clinical case in question. he implant becomes functional. It is used either as a support for a fixed implant (bridge or crown) or to stabilise a removable implant. The mounting of an implant necessarily involves a thorough mouth examination including a scan in order to ascertain the exact volume and quality of the bone very precisely at the implant site. If it is decided that this is the required treatment, implant mounting takes place under local anaesthesia with aseptic surgical conditions. Two to three months later, the implants become fused with the bone. An abutment stump is screwed into the implant and a ceramic crown or bridge is permanently attached.